Perfectly meshes horror with conspiracy theories; lacks the social undertones of Get Out but is ultimately the better film. It’s only natural to compare writer/director Jordan Peele’s Us with his celebrated debut film, Get Out. Both are horror comedies, though Us arrives with a somewhat darker tone. The subject matter is more serious. In Get Out, we feel like we’re watching a satire, one steeped in the horrors of the racism that continues to exist in our otherwise enlightened society. Unlike Get Out, where bizarre events needed an explanation in order for them to feel justified, the crazy events in Us could have taken place regardless of any subsequent explanation – although we still get one. Us feels like it holds more weight within the film’s wild internal universe, which is, ultimately, what makes it the better film. Everything we see on screen isn’t wrapped up in a neat, tidy little bow. There’s a lot to digest. You’ll walk away thinking deeply about what you just watched and may even create a few theories of your own. Us opens with text briefly informing the audience about the hundreds of miles of unused tunnels below ground throughout the United States. Until later in the film, we can only speculate on this connection to the events that follow. The story begins in 1986. A young girl, Adelaide, strays from her family while they enjoy a night out at the local beachfront amusement park. She enters a house of mirrors, a creepy place even when surrounded by others, but alone she encounters something far more disturbing: a near-perfect replica of herself, her own doppelganger. Flash-forward to 2019. An older Adelaide (Lupita Nyong’o) returns to her childhood vacation home in Santa Cruz with husband Gabe (Winston Duke) and their two children Zora (Shahadi Wright Joseph) and Jason (Evan Alex) in tow. Traumatized by memories of what happened there as a child, Adelaide becomes apprehensive about this trip. She confides in her husband about her fears, but Gabe isn’t sure if he believes her or not. After a series of strange coincidences she interprets as omens freaks her out, Adelaide lets Gabe she wants to leave immediately. But on that very night, four strangers show up in their driveway. Gabe tries confronting them, but the odd people don’t react. Suddenly, these odd people make their way into the family’s house. It’s revealed these invaders are, in fact, dopplegangers of not just Adelaide, but the entire Wilson family. Just like the one in Adelaide’s childhood they look exactly like each member of the family, except more animalistic and creepy, speaking with grunts and scraping voices. They’ve shown up to untether themselves from the family. And by untether they mean kill them. Peele has improved his directorial style in almost every way since Get Out, furthering the case he’s here to stay. He’s proven himself quite adept at delivering original and unique horror, though as someone with firm roots in the world of comedy he can’t seem to help himself – for better or worse. There’s plenty of jokes to help lighten the mood, some more appropriate than others, with Peele grounding his movies in reality with humor and relatable characters. In Get Out, he was telling a story about racial stereotypes as a way to make himself – and those who could relate – laugh at the sheer ugliness of prejudice. Perhaps because it lacks the subtle finesse of that film’s satirical tone, despite its segues into deep conspiracies, Us feels more grounded in reality. 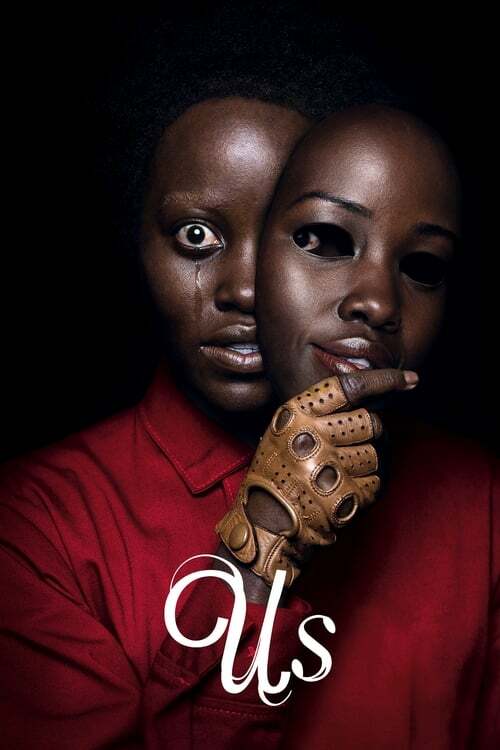 Nyong’o gives an especially haunting performance as her own doppelganger – perhaps the scariest thing in the entire film. But it’s Duke that really leads the charge, essentially playing a doppelganger (of sorts) to Peele here, ala Owen Wilson’s Woody Allen in Midnight In Paris. It’s almost difficult to believe this is the same person who played the hulking, intimidating M’Baku in Black Panther. He’s very impressive. Duke’s jokes aren’t always irreverent, but they help connect us to the family in a film that often struggles to inject depth into its characters. In fact, the doppelgangers appear to have more to them than their above ground counterparts. Maybe that’s the point. Sure, Us is riddled with plot holes galore, although the film never contradicts its own logic long enough to become off-putting. Peele gives us (the audience) just enough of the good stuff to help write off these glaring missteps as innocuous. It helps that the movie as a whole is a sort of allegory, as it would have to be in order to further a conspiracy theory as grand as this. Us does have something major in common with Get Out, in that both have the facade of existing to provide us with social commentary. Peele does this convincingly by giving us something to latch on to. Here, it’s the idea of America’s lower-classes being given the short end of the stick from the start. But that’s just catnip for those who crave social context in their horror films. In a less subtle way, Peele is exploring theories surrounding America’s unused tunnel systems because he thinks conspiracy theories are cool. He’s not wrong. With Us, Peele’s priority isn’t just to scare us, but to tell an enticing story, which he’s done successfully now, twice. Ethan Brehm Popzara welcomes guest reviews, editorials, and other fascinating pieces of original content. Think you have what it takes to join the fun? Contact us and find out today!